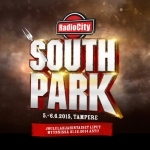 Def Leppard will play the South Park Festival in Tampere, Finland on 6th June 2015 according to the festival website. The band will play for the first time at this festival in Tampere on Saturday 6th June 2015. The third European festival date announced so far for 2015. Other acts playing include Accept who Lep toured with in November/December 1981 when they both opened for Judas Priest. This will be the first show in the country since June 2008 and the fourth overall since the first time in June 1981. 10 shows have now been announced for the 2015 world tour all in Europe. Their biggest run of shows on the continent since 2008. Played for the first time. The first show in Finland since June 2008 on the Songs From The Sparkle Lounge tour. "Next summer, the Tampere South Park burst. The second edition of the Radio City South Park Festival offers festival-goers a more ronskimpaa food and rock 5-6.6.2015 time. Really tough performer from the list published today, Def Leppard, Helloween and Accept. More performers will be published in January, so subscribe to the newsletter and be first to hear the hottest South Park news!"